that serves as a breathing tube allowing the larva to breathe while submerged. appearance but has only one pair of wings. Its body is brownish to black. <?xml:namespace prefix = v ns = "urn:schemas-microsoft-com:vml" />"Rat-tailed maggot" is the common name given to larvae of the drone fly (Syrphidae: Eristalis tenax (L.)). 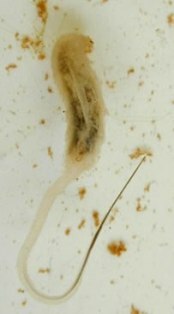 The name refers to the maggot's long tail, which is actually a breathing tube, or siphon, used by the maggot to survive in very wet environments. Maggots breed in stagnant waters high in organic matter. At livestock facilities, rat-tailed maggots can be found in manure lagoons or settling ponds, poorly-drained areas collecting runoff from manure mounds or silage pits, and in water tanks and ditches with stagnant water. Philip and Mengersen (1989) report that adults lay their eggs in the spring at suitable sites. Eggs hatch in about a week. Maggots develop through the summer and pupate, usually in late July and August. Pupae cannot survive in the very wet environments where the larvae develop. Hence, prior to pupation, larvae leave the breeding site to find drier and more protected sites. It is during this period of migration that rat-tailed maggots are most often noticed by owners and employees of livestock facilities. The pupae are frequently found near larval breeding sites, under debris and equipment, or behind walls. Pupae are grey in colour, hard, and about 15 millimeters in length. They have a shorter, but recognizable, remnant of the larval breathing tube. Details on the remainder of the lifecyle are sketchy. It is thought that adult flies emerge from the pupae after three weeks, then seek overwintering sites. Alternatively, the insect may overwinter in the pupal stage and emerge in the following spring. Adults feed on nectar and probably serve a minor beneficial role by pollinating flowers. Drone flies belong to a larger group of flies technically called Syrphidae, with the common name flower flies or hover flies. Drone flies, the adult form of the rat-tailed maggot, may be mistaken for honey bees, which are of similar size and colour and also frequently seen near flowers. However, drone flies have a swift, darting pattern of flight and are often seen hovering. In addition, drone flies have a characteristic curved wing veination that can be readily seen on dead specimens (see below). Rat-tailed maggots are harmless to livestock, pets and people. They are considered a pest only because their presence may reduce the aesthetics of livestock facilities. Consequently, there are no chemicals registered for the control of this insect. If control is desired, low-lying areas with accumulations of stagnant water should be drained whenever possible. This will eliminate breeding sites for rat-tailed maggots, and also is likely to reduce populations of stable flies and house flies and regular flushing of manure collecting and storage facilities every 2-3 weeks, especially in early summer will prevent the buildup of maggots later in the season. Rat-tail maggots found in the stagnant water shown in the foreground of the picture to the left. Pupae were collected from beneath the tires nearby.Two minutes work with a shovel would have drained this pool of water, eliminating it as a breeding site for rat-tailed maggot and other pestiferous flies.